» I've been to Mars! Hi everyone, I'm a newbie and just wanted to introduce myself. My name is Mal and have spent the past two weeks or so reading some absolutely fantastic posts and consequent discussions and wow! what a wonderful bunch of super enthusiasts with incredible depth of knowledge.... somewhat reminiscent of the now defunct "Meta Research" site hosted by the late Professor Tom Van Flandern....if I could make to bold. A little backdrop. I'm an architect/designer by profession with a deep love of anything Mars and our Solar System. As a interior 3D designer for over 30 years, I'm no "spring chicken" but over this time, I've spent millions of hours working in dimensional perception, as a result, I've developed a strength in seeing depth of field with clarity, very useful in image analysis of the Martian surface. I guess we all bring our baggage along with us LOL. Anyway, about five years ago, I had some time and decided to explore the reality or not, if there was life "out there". (As a skeptic by nature, in principle, I try to analyze as close to the scientific method where possible using all the available data at my disposal). After reviewing the many images sent back by the rovers, I realized early on, the data was limited . So I opted for both the Mars Express and MRO images specifically for the return of their awesome high definition experiences. Moreover, 2D didn't cut for me. Fortunately, as we all know, both orbiters were equipped with wonderful "stereo cameras" and after many torturous hours of downloading the massive JP2 images from ASU and consequent manipulation and cropping, I finally got the handle of it, "3D images galore galore"
The rub, if you haven't experienced Mars in 3D well....you ain't been there! Ok, here's the short and curly. I started out in the neg and ended in the pos. In the coming weeks, I hope to show you my results but must advise, most of this evidence is in 3D, all of which I have produced myself using some very sophisticated software. I'm hopeful most of you will have the necessary anaglyph glasses to accomplish the task. To begin and a good test for me, is a nice image of the Hebes Chasma cliff-side target, one of many of this enigmatic hole in the ground I'd like to discuss with you in the pursuing months. Thanks again and please be gentle. Life DOES "exist out there" but it's not what you think.! Re: I've been to Mars! So what is your conclusion? 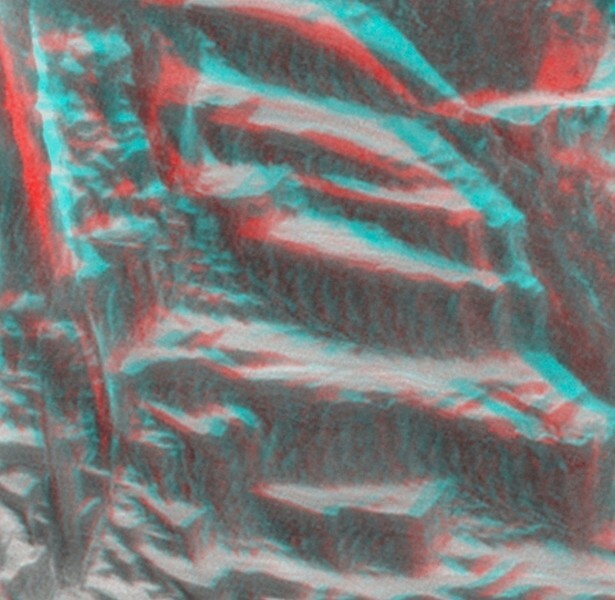 What sort of "life" have you seen in your 3D images? In the coming weeks, I hope to show you my results but must advise, most of this evidence in in 3D, all of which I have produced myself using some very sophisticated software. I'm hopeful most of you will have the necessary anaglyph glasses to accomplish the task. Thanks for the quick reply. In the UK where I was from about 33 years ago - London born, please to meet you! Understanding the current "physics" of Mars, it's easy to conclude, there is little chance of any life there and so, at the risk of repeating myself with the acronym "IMO" or "IMHO" I'd like to change this to "FMP" or... "from my perspective" only because; "I personally see...therefore it is". So these are my interpretations. Others will see other things, patterns which I gracefully acknowledge. This is important. Human perception, and hopefully you'll agree, have differing interpretations. All perceptions and comments therefore, are welcomed here and btw, I've read several of your posts Louis and bow to your knowledge!! To your question; what are my conclusions? Even with the resolution of the MRO images, it's almost impossible to "see" if there are "walking aliens", the vantage point just doesn't allow it even at 80cm resolved, however, the ARTWORK renditions do... and they are numerous. From that artwork, I have concluded that intelligent life does indeed reside there (loosely put) in abundance at least to the time stamp of no less that 80 to 90 years. Can I prove it? Yes I believe so, and will post images, otherwise you'll think I'm a "sandwich short of a picnic", so the onus is now on me. Hopefully, you'll find the anaglyph glasses. IMHO FMP there is some life on Mars but its microbial to small maybe no bigger than a chipmunk... in closed loop caverns that would allow for a unique spicies to exist. Even earth has such small colonies....so why not Mars. I agree SpaceNut. If Mars had abundant water, if there was frequent exchange of material between Earth and Mars and vice versa and if Earth has such isolated, niche subterranean colonies, I see no particular reason why life shouldn't exist in such pockets on Mars. As for what might be on the surface, the sooner we get people to Mars to examine the various anomalies thrown up by the rover photos, the better. Thanks for the welcome guys, I hope I can contribute in our exploration of this mysterious world. I'm trying to figure which forum to open a thread on and keep within the guidelines. Intelligent Alien Life looks about right so see you there?